I love some gadgets. By now you might have observed this from the amount of them that I use. From miniature pie makers to donut makers to ravioli presses, if something has a purpose in the kitchen and I can use it, I'm all over it. That IS the thing about gadgets, though, they have to be useful--otherwise they are just taking space in your kitchen... and for me, space is at a premium. For all of these reasons, I love my inversion blender. It's a small(ish) gadget that doesn't take up much storage space. It's useful AND to top it all off, it's easy to clean. Plus, I like saying "inversion," because, we can all agree, it's a fun word. So you might be wondering, "If I have a blender, and I have a food processor, why would I need another gadget for blending?" Well I am so glad that you asked. The inversion blender does things that the blender and food processor can't do--like blending a giant pot of sauce in the pot. Let's observe, shall we? So here she blows! It's easy to use, basically two pieces that attach to one another and all you have to do to run the sucker is push a button on the back. Easy as pie. The one draw back is that you have to plug it into the wall, but this has never been a problem for me as the cord generally reaches where I need it to. Okay, here we have said pot of pasta sauce. As you can see, I didn't blend my tomatoes ahead of time. I just threw up in the sauce. Lucky for me, the inversion blender will do the trick! Literally, you just put the blender into the pot and you "stir" as you hold the button down! Look at that! It's really getting blended! 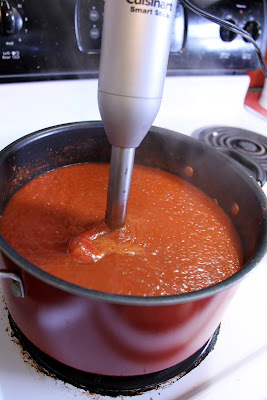 A smooth, well blended sauce...amore! And now that I am done with it, I just detach, wipe down the electrical part and then throw the detached portion in the dishwasher. 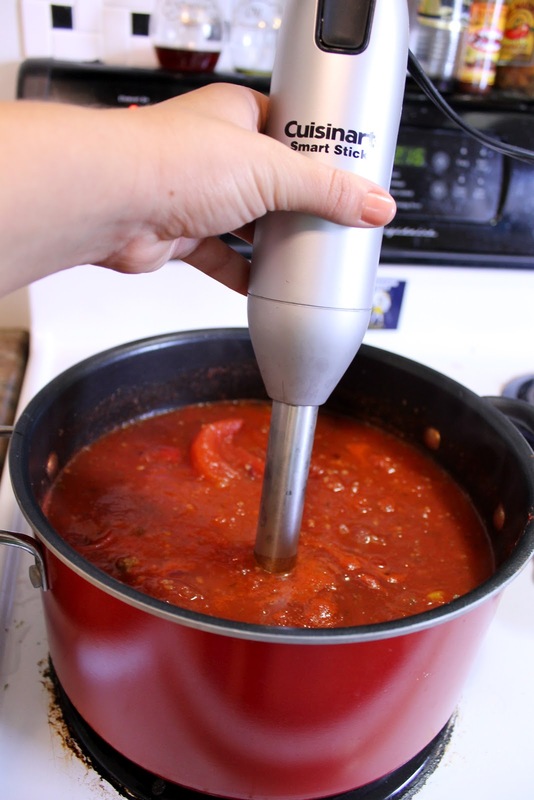 Of course sauce isn't the only benefit of this magical wand-like blender. You can do smoothies, soups, or anything else you want to blend in a pot! That makes this gadget unbeatable in my eyes. The price point is also something we should talk about because it's cheap enough to buy as a gift or for yourself. I paid somewhere between $30-$35 for this gadget and it has come in handy numerous times! I give this gadget four out of five stars! Kind People Are My Kind of People! Stuffing In A Skillet Recipe! Have More Confidence In The Kitchen!